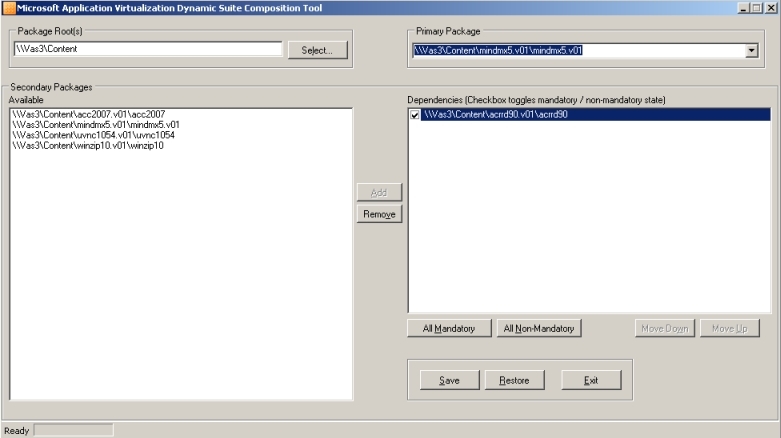 The first available tool within the Resource Kit is the Dynamic Suite Composition Tool. In App-V 4.5 one of the stunning new features is the possibility to connect another separated virtualized application into the bubble of the application. In this way the need to install some applications physical on the system or embed middleware into the same virtualized package are reduced a lot. To accomplish the Dynamic Suite Composition Tool you need to add into the OSD which applications can be called into the bubble. This can be done via the sequencer or manually add the OSD file. The sequencer method is not naturally, while editing the OSD file manually is a bit tricky because of typos. With the Dynamic Suite Composition Tool this action is simplified a lot. The first time you start the tool you need to specify the location of the App-V content folder. This folder will be searched for App-V packages and those will be displayed. Next you need to select the application which needs the additional software as the primary application. From the left pane applications can be added to the OSD file as applications which are available within the primary application bubble. You can also configure if the application needs a mandatory (application will be started directly when the other application starts) or non mandatory (application will be started when the other application calls the application). The real cool thing is that the tool also recognizes manually created DSC configurations. When the DSC is created with this tool there is also a possibility to restore the previous configuration. This SFT Parser Tool is utility is build to inspect and extract information from the SFT files. The utility is command line based and running the executable show all the available parameters. Personally I found the parameters -V and -I the most useful. With the -V parameter you can check if the SFT file is valid, for example when you have copied the file over unreliable WAN link. The -I parameter can be used to determine the version number of an executable within the App-V Package without starting the streaming of the application. Other useful parameters are -S to show the statistics and -F to display all files within the App-V package. The third tool is build for the usage of the clients. The App-V Listing Tool needs .Net Framework 2 on the system to be used and is a (also) command line based utility. With the tool can be determined which applications running on the system are being started using App-V. The tool can be useful for troubleshooting tasks to determine if the issue is occurring in a App-V application or local application. Personally I find the other tools more useful. Also this utility is created for the client. Within the properties of the App-V Client you can specify the size for the App-V Cache file (the file where the App-V packages are cached). With the Cache Resizing Tools you can configure the Cache File size from a command line. Both the fixed size and the minimum free disk space options are available. The tool can be started using Electronic Software Deployment system or manually, but the tool is created for the first option. Personally I always use the additional ADM template provided by former colleagues of Login Consultants to centrally manage the cache size. The last tool available within the resource kit is the Client Log Parser Utility. This utility helps you to identify errors in the App-V Client log file much easier. The App-V Client log file exists of many entries and it can be a bit difficult to find the right information. With the command line based Client Log Parser you can specify on several settings where the tool needs to search for. You can search on almost all available part that are logged where launch failure (/LF), upload times (/UT) and launch times (/LT) are probably the most used parameters. This is a real nice utility to quickly find the events you are looking for. The tool parses the found information into another file, which can be opened easily in Microsoft Office Excel which makes it even easier to view the data. I really like that manufacturers are supplying add-on tools for their product. Within this App-V Resource Kit are some very useful utilities. I really like the Dynamic Suite Composition Tool and the Client Log Parser, but also the other tools can be useful for several situations.